Yi Sang (1910-1937) is today considered one of Korea’s most innovative poets. Trained as an architect, he used geometry and mathematics to stretch conventional linguistic limits. 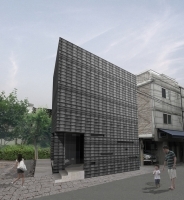 The Arumjigi Foundation asked five architectural practices including Lokaldesign to develop a concept for a memorial centre to the poet in an old neighbourhood of Seoul. We maximised the use of the site by organising the building into three separate volumes, each adaptable to meet the challenging requirements of contemporary art practice. 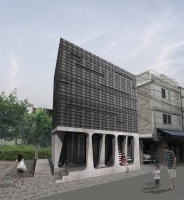 By opening up the façade, the ground floor becomes part of the streetscape. A twisting steel plate cuts through the building and separates the staircase from the exhibition spaces. Structured steel panels weather on the façade, referencing Yi Sang’s obsession with patterns. 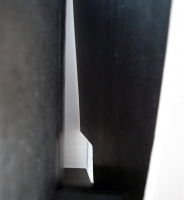 We developed two options, one with and one without interweaving columns defining the ground floor facade. 유명한 위인이자 놀라운 시인 중 한 명으로 알려진 이상(1910-1937)은 건축가로서 터득한 기하학과 수학적 패턴을 일반적인 언어의 영역에 까지 끌어들인 것으로 유명하다. 재단법인 아름지기는 로칼을 포함한 5섯명의 건축가들에게 이상이 서울에서 살던 옛 집을 이상의 기념관으로 개발을 부탁하였다. 현대의 예술가들을 위한 전시관으로 제안한다.